"St. Alphonsa," made in the regional Malayalam language and spoken in the nun's native state of Kerala, begins with a priest narrating the story of her life to a group of children visiting her tomb. "I was a regular visitor to her tomb. I have experienced a divine feeling after making the film," said V. S. Jose, who co-directed the 90-minute film with Jayeendra Sharma. "I am sure the viewers will also get the same feeling." Alphonsa's canonization took place on October 12, at a time when Christians, who make up just over 2 percent of India's billion-plus population, have come under fresh attack amid long-running tensions over religious conversions. But the film steers clear of religious riots, piecing together the saint's life with the help of books and people who were associated with Alphonsa. 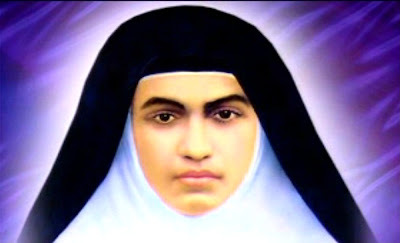 "St. Alphonsa" was shot in locations around Bharananganam, where Alphonsa lived until her death. "It shows the ancestral home of the saint, the school where she studied and the convent where she served as a nun," Jose said. The low-budget film, slated for release in Kerala on November 6, features an actress who closely resembles the nun.